Here comes a docu- martial arts competition TV series! LOS ANGELES, May 22, 2017 – Bunim/Murray Productions, renowned world-wide for its hit reality series and Australian-based Company Chiron Global – the founder of combat sport Unified Weapons Master® (UWM) and leader in wearable technologies have joined forces, to develop the world’s first high-tech Martial Arts Experience docu-competition series, Unified Weapons Master: Calling All Contenders. Emmy® Award-winning producer Bunim/Murray Productions, best known for the long-running The Real World, Keeping up with the Kardashians and Project Runway, will marry its production expertise to UWM’s technology to create a revolutionary and innovative new entertainment experience for a global audience. Combining Chiron Global’s advanced technology with traditional martial arts and ancient weaponry, UWM: Calling All Contenders has the features of a live video game, enabling the world’s best weapons martial artists to compete in full contact combat. Chiron Global has adapted its proven world-first capabilities in building sensor technologies into highly protective body armor that will enable the world’s top skilled weapons martial artists from a wide range of martial arts and cultural backgrounds to face one another in battle for the first time with science judging the winner. The real-time wearable sensor technology is linked to a medical database that measures the force and location of every strike. The Lorica armor and patented scoring system objectively measures the force and location of strikes to the weapons martial arts competitor in real time, and is able to display the damage that would have occurred to an unprotected competitor on a video screen. “We believe that UWM has massive international appeal to a diverse audience because it combines so many exciting elements that are really on trend at the moment. It combines weapons martial arts combat and ancient weaponry with leading edge technology and live video gaming features,” said Bunim/Murray Productions CEO Gil Goldschein. “In addition to the high level of protection offered by the protective Lorica armor, the ability to customize the suits, the CGI scoring system and the cultural backgrounds and histories of the competitors, will make for a rich viewer experience,” added Julie Pizzi, Co-President Entertainment and Development, Bunim/Murray Productions. The Lorica armor acts like an extreme form of games console providing actual engagement data on the force and damage from each impact and showing this on the scoring system a bit like a video game. 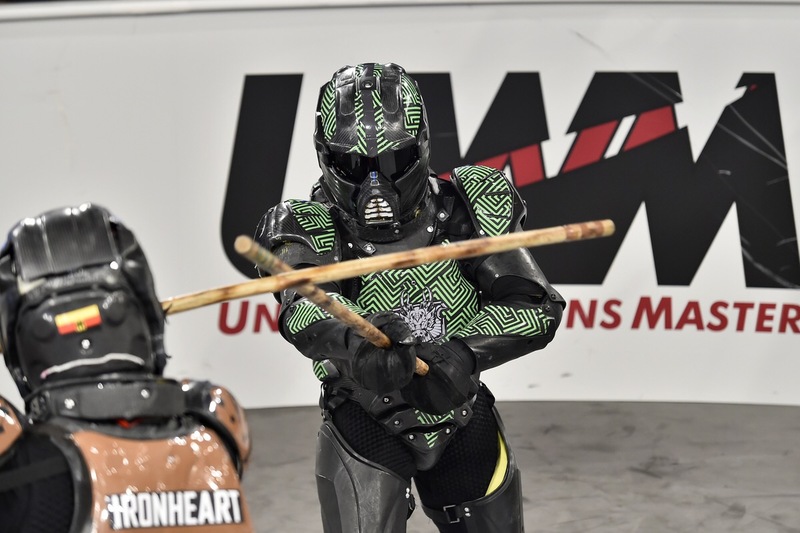 “One of the key differentiators of UWM is that through the Lorica’s advanced sensor tech, which is connected to a medical database, we are able to offer viewers a fully immersive data-rich experience,” says UWM CEO, Colin Blake. Other technologies that are able to be incorporated into the armor include cameras inside the helmets, and two way microphones, to give viewers a first hand experience of what it’s like to compete wearing the Lorica. Previous What happened to Generation Next?! Next Time for a change! Welcome to the Kiai-Kick Youtube Page!